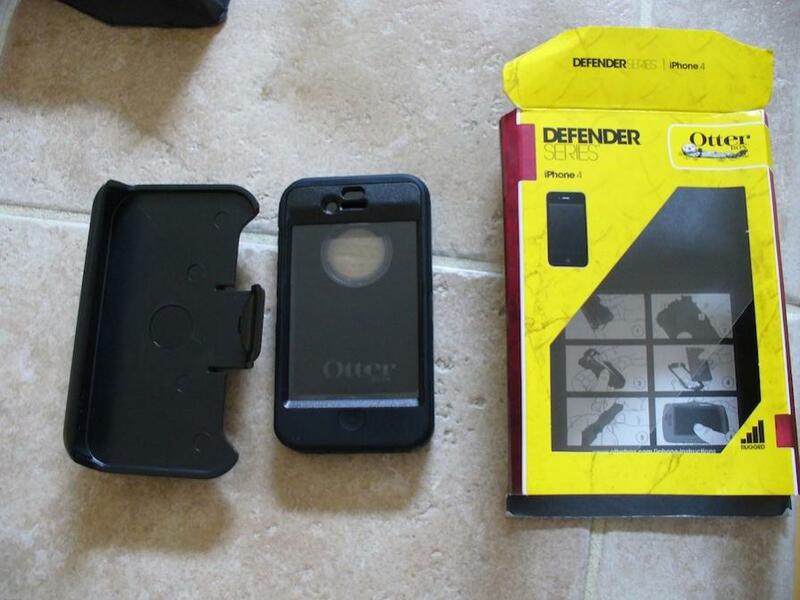 I received my Otterbox Defender case for my new iPhone 4 today. Here are my first impressions and some photos. First, the box was semi-crushed. Its not really Otterbox's fault but more FedEx. Its no big deal really. The case comes in a yellow box and includes a belt clip. After opening the box, I found the case already assembled (minus a phone) and clipped into the belt clip. The belt clip seems to fit the case snugly and doesn't appear that it would pop out easily. Since I don't use belt clips, I won't be able to put this to the test. After removing the outer silicone sleeve, I found that the case is similar to the 3GS case in terms of it being two halves of polycarbonate plastic with a clear front semi-rigid screen protector. The back half has a clear cover to protect the Apple logo as well as cutouts for the camera and flash. Installing the case is fairly straight forward, although it will NOT fit with a Zagg installed. I even tried just removing the back and it still wouldn't fit quite right so I had to remove my screen protector as well. I'm not too concerned about that because these cases are so tough I know my phone will stay pristine. Anyway, after removing the Zagg, I placed the phone into the piece that covers the back. Then simply slide the front piece on, bottom first, into the top piece. There are 3 tabs that lock into place once its put together. After that, carefully install the silicone sleeve over the whole thing and tuck the edges into the hard plastic portion to complete the installation. 1. A Zagg or even just a regular screen protector will more than likely NOT fit. They are unnecessary once you have this case anyway. 2. There is a soft felt that lines the back piece of the case, obviously to protect the back of the phone. The 3GS case does NOT have this. 3. The plastic shell portion of the case seems to be a bit thinner than the 3GS version but because its made from polycarbonate it should be just at durable. 4. The silicone cover is a bit thin in spots so BE CAREFUL when installing it not to stretch it or pull to hard, especially around the silent switch area. 5. This one is BIG! The 3GS Defender had a problem with its built in screen protector sticking to the iPhone screen and causing an "oil slick" type look. An anti-glare screen protector or even a light coat of baby powder remedied that issue but I'm happy to report that this DOES NOT happen with the new Defender. I assume they went with a different material after receiving complaints about the old style. Overall, I like it. A lot. I have been a big fan of Otterbox products from day one and I find that they are the only company out there that really takes the time to make sure they think of everything when it comes to protecting your device. Yes, they are bulky compared to other cases but this is the ONLY case that I would trust in case of a fall or other impact to my phone. This is some serious protection for a serious phone! Its not really designed that way, but you can set the phone up with it in the clip. The clip portion does rotate to allow you to position it at any angle. I have received my OtterBox Defender case a couple of weeks ago and I love it. I got it from Bensbazaar.com. I was hoping to get one for my best friends birthday but they were all sold out because of how popular it is. I only paid $27.79+$7.00 shipping. I was told that more will be coming in soon.